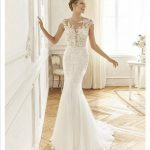 This spectacular silhouette crepe gown, with a mermaid skirt with thread and rhinestone embroidery appliqués is simply stunning and it stylizes the figure to the maximum. 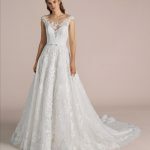 The tulle bodice with thread embroidery and crystal sparkles has a v-neck and an open back, framed by crystal tulle embroidered with polka dots! A wedding dress inspired by the female body that is capable of accentuating the beauty of its curves and the sensuality of the illusions.